My first official Thanksgiving dinner was many years ago, during a visit to Plymouth, Massachusetts. My second was just last Saturday night, when The Boss and I were part of a group of 36 people on Mallorca enjoying an early Thanksgiving Dinner. I know, we’re not American ourselves, but what a wonderful excuse to enjoy great food and company! The celebration – their second on Mallorca – was the idea of an enterprising young American couple who moved from the bustle of New York and now live in a village on this island. It would be hard to find two places more different from each other than New York and Puigpunyent! Ross Hutchison is a private chef; his wife Joanna Cybulski is a designer and art director (and jolly good party organizer). They’re making a name for themselves when it comes to entertaining – whether it’s professionally or socially. We’ve certainly enjoyed the few occasions when we’ve been able to enjoy their food and hospitality. This early Thanksgiving Dinner was the perfect antidote to some unusually wet and grim November weather, with delicious food and very good Mallorcan wine (from Bodegas Angel), and lots of convivial conversation. The venue was Alqueria S’Hermita – a luxury agroturismo in the countryside outside Campos – which had recently passed into the hands of new owners, who generously allowed us all to invade their woodburner-heated space (and joined us all for dinner). 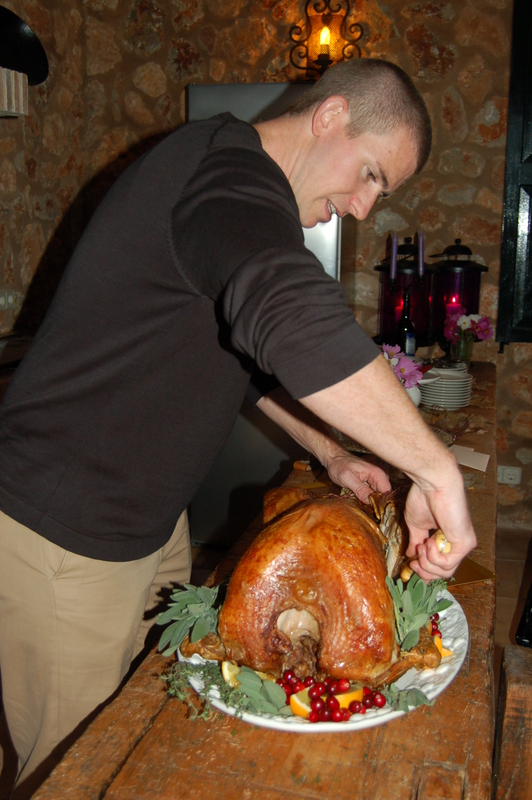 Ross carves one of two golden turkeys. Ross and his young sous chef for the day, Jack Knox, produced two golden roasted turkeys, which were carved at the front of the room. Joanna, an attentive hostess, carried an enormous platter from guest to guest, so that we could help ourselves to the succulent meat. Then we all helped ourselves from the large dishes of accompaniments on the tables, including cornbread, sprouts, baby onions, and stuffing. Fresh cranberries brought over from the States were turned into a delicious cranberry sauce – a world away from the stuff that’s found in jars. There was more than enough food for everyone to have seconds if wanted – and quite a few did! Next came a really delicious pecan pie – made with ingredients brought over to Mallorca by Ross’s mother during her recent visit from the States. 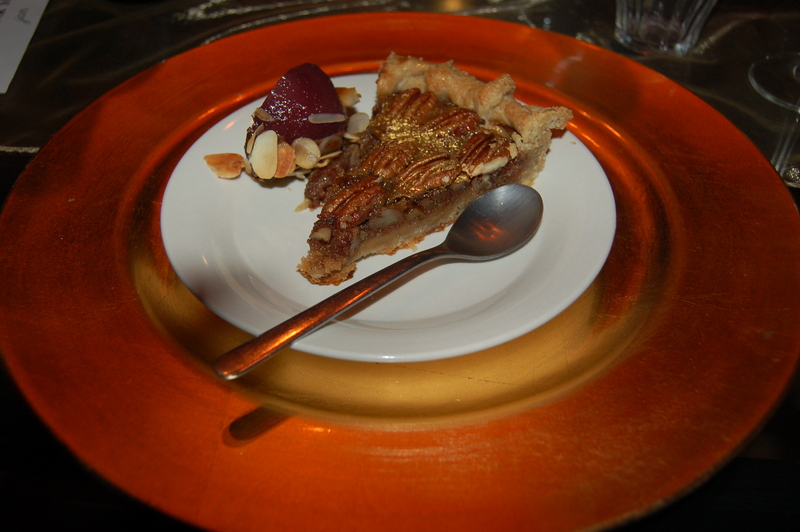 A pear, swathed in chocolate, accompanied the pie. Who cared about calories? Nobody at this dinner! Joanna had decorated the room simply but charmingly and achieved the impressive feat of arranging for 36 people to sit at a series of tables, cleverly arranged in a reverse ‘s’ shape, so that we were all effectively sitting at one table. Bet that girl can work a Rubik’s cube. If you ever need the services of a private chef on Mallorca – whether for a holiday on a yacht or in a villa, or for an event – we can recommend the services of chef Ross Hutchison and his wife Joanna. Now, I wonder if he’s available to cook our Christmas turkey…?